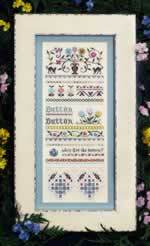 Nothing is known of the girl who stitched the original sampler. 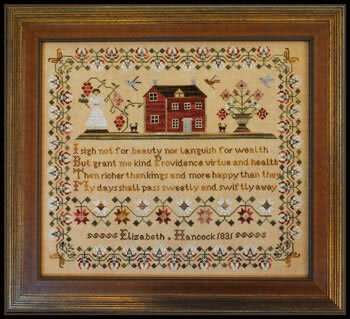 The verse, I sigh not for beauty nor languish for wealth, But grant me kind Providence virtue and health. Then richer than kings and more happy than they My days shall plass sweetly and swiftly away, is from the English poet Hanna More. Stitched on 32ct Vintage Examplar hand-dyed linen, the finished size is approximately 17.75" x 15.2".